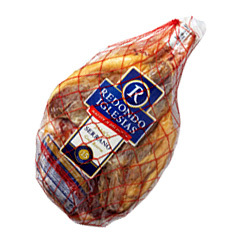 The Redondo Iglesias Ham, a guaranteed quality product, is an exquisite Spanish ham of traditional and emblematic flavor, prepared with the best raw materials, which are ideal for the realization of cured ham of the highest quality. Its delicate aroma and a distinctive flavor, makes of the Redondo Iglesias Ham an emblematic representative of the Spanish gastronomy. with a constant quality and the taste of tradition.